In a small workshop versatility is very important. 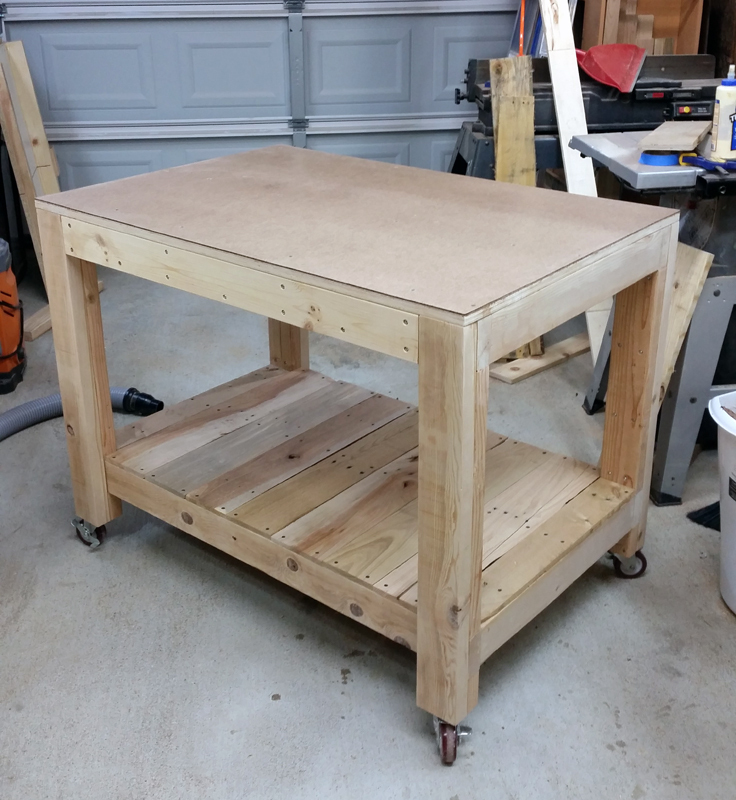 Assembling projects without a large flat work surface has been a huge issue for me in the past, so I decided to tackle two needs with this project! 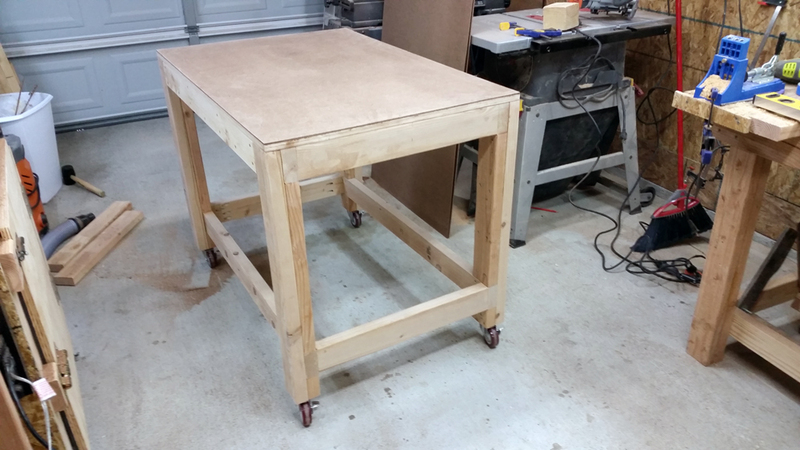 This table is the correct height to serve as an outfeed table for my table saw and will work very well as an assembly table in my small shop. The table is 45"L x 30"W x 35"H. I chose these dimensions because they were the dimensions of a piece of Baltic Birch plywood I got at the local ReStore for a very good price. Start by cutting down the 2x4"s to length for the legs and all side pieces. Cut a 3" block to serve as a spacer for the long stretchers to rest on and glue them onto the bottom of the legs; make sure they are flush with the bottom cut edge of the leg. The block will also help to keep things square during assembly. You can see here how the 3" block provides a reference for laying out the stretchers. Glue and screw in the bottom stretcher and add another 2x4" piece above it leaving a 3 1/2" gap at the top for the top stretcher. Repeat these steps to make the same assembly for the other side. Drill pocket holes in the pieces that will be the supports on the short side. You will need 4 of these pieces. Somehow I failed to take a picture of everything all glued up before assembly, but glue and screw the short side supports to one of the side assemblies and set the other side assembly on top of it. Take diagonal measurements to ensure that the frame is square and then glue and screw the other side assembly to it. 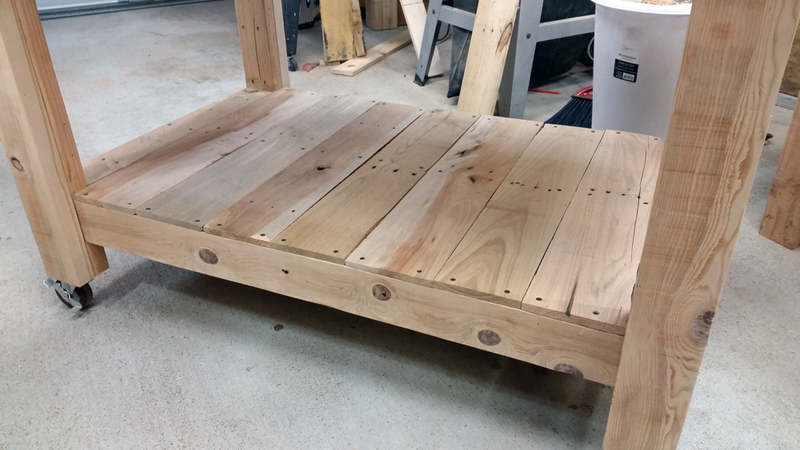 While the frame is upside down, go ahead and screw on the casters to the bottom of the legs. 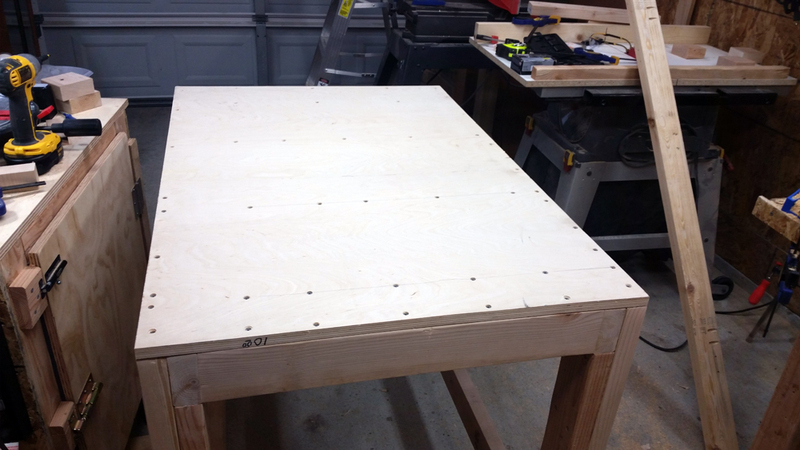 Install the plywood top using 1 5/8" wood screws, be sure to pre-dril and countersink the screws. I am using a hard board top that can be easily replaced if the table becomes too gunked up with stuff. Cut the hard board to be over sized. Predrill and countersink the screws and screw it down to the plywood using 1 1/4" screws. 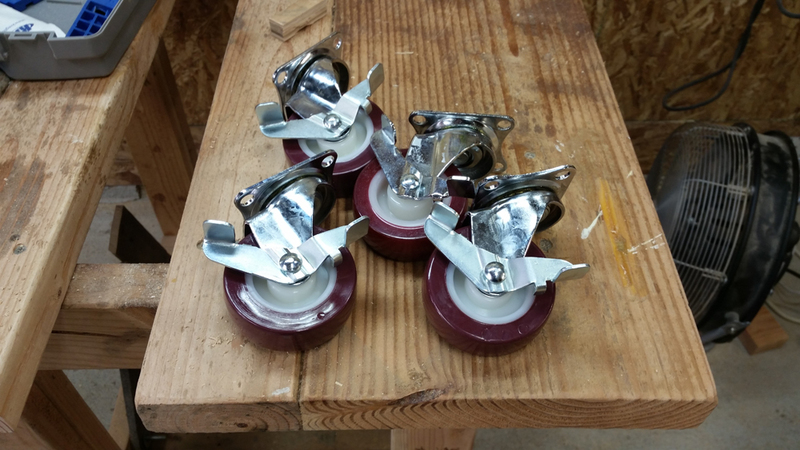 Using your router and a flush trim bit, set the bearing to ride on the plywood and cut the hardboard flush with it. This will make a huge mess, but produces a nice result! The table is nearly done! Just cut down some pallet wood scraps to size and screw them onto the bottom stretchers to give yourself a shelf to store additional tools or supplies. Your new assembly table is finished! I hope you enjoyed the build process and find this useful for building your own! If you have any questions on this feel free to comment or contact me for additional information!